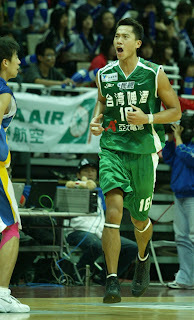 Taiwan Beer used a 23-7 third quarter to rout Yulon in Game 3 and took a 2-1 lead in the 2008 SBL Finals on Sunday. The defending champion made five threes, with three of them came from Yang Ching-min, in a 21-4 run to open the second half, boosting its six-point lead to 23, and won the game 81-64. Ho Shou-cheng scored 18 of his game-high 21 points in the first half, when TB led 37-31. Yang Ching-min and Chen Shih-nian took over in the second half, while leading scorer Lin Chih-chieh made up for an awful shooting night (9 points) with other dimensions of his game, collecting 7 boards and 7 assists. TB made 10 of 19 three-pointers in the game. Yulon couldn't find the basket all night long, shooting 33% as a team. Chen Hsin-an led with 20 points but nine of those came in the fourth quarter, when Yulon already trailed by 20. Once again, it seemed to me Yulon players were tired, playing for the third successive night with an (almost) six-men rotation. Other than Chen, no player reached double-digit scoring. On Saturday night, it was Yulon coming out on top and leveled the series. Yulon limited TB to 3-of-17 from the three-point range in a 79-68 win, leading by as many as 20 points in the third quarter. Chen Chih-chung led Yulon with 21 points, 6 rebounds and 5 assists while Yang Che-yi had 20. Chen Hsin-an had a subpar shooting night, making one of five field goals attempts but was 10-of-12 from the foul line. Chen had 12 points and 7 rebounds. Lee Hsueh-lin had 8 points and center Tseng Wen-ting had 10 points and three blocks. Wu Tai-hao led TB with 22 points. Lin Chih-chieh had 13.